In uncertain times many families have been changing the way they manage their finances and lifestyles. The shift to simple living has become more and more popular. Often times it takes a serious crisis to get people to re-evaluate their situation and then change. This is certainty happening right now with the instability in financial markets across the globe. Simple living doesn’t entail a boring or lower standard of living. It’s more about being aware of finances and living in a more conservative but informed way. In many instances it’s a review of a family or personal budget, cutting out the wastage and strengthening savings or paying down debt. The degree in what to “live simply” means will vary dramatically from family to family. For some it can be a reduction in eating out, cancelling paid TV, camping instead of overseas holidays, etc. Regardless of the differences in circumstances and how they are perceived, a shift from a spontaneous or casual financial lifestyle to a more educated and informed one should be welcomed in one’s life. Below is a small list of simple ideas to help save money and create good financial habits. DIY Projects – This can range from home renovations and landscaping to vehicle maintenance. If you have the time and a bit of knowledge, taking on projects yourself will not only save money, but also provide a sense of accomplishment. Buy in Bulk – Purchasing in bulk is a great way to save money and reduce the amounts of times you have to go to the store. The savings from buying in bulk can be very significant. Shop Online – The amount of deals online is tremendous and easy to find. Take the time to research and compare prices, you’ll definitely find bargains. Consolidate Debt – Reduce the amount of interest you pay each month by combining all your debt into one. Debt consolidation can allow you to reduce your monthly repayments and save in interest in the long term. You’d obviously have to consolidate your debt to a lower interest rate than what you’re currently on. Spring Cleaning – You don’t necessarily need to wait till spring to clean out your house and get rid of unwanted or unused items. Go through all the unwanted items in your house and sell these things on Ebay, local classifieds or in a garage sale. Not only will you clear up space at your residence, you’ll also receive some good cash. Budgeting – Create a budget to of current spending habits and then make adjustments as need be. A good budget will clearly show where wastage is occurring. Simplicity and minimalism are two good values to adapt as they will surely help you improve your personal finance big time. These days there are numerous online resources and tools to help families with making informed financial decisions. It is easy to search online and find the information you need to assist in simple living. The more simple we live, the happier we become. I love it! Very true and it helps appreciate things more! Good tips. We do many of them, some more than others. The biggest one for us is definitely budgeting. I like how it allows me to see where our money is going and what changes might need to be made to put our money to better use. Budgeting is one of the most important thing a family or person can do. It keeps people organized and out of debt. At the end of the day, all the simple living tips and others that haven’t been messaged should tie back to a budget in some form. We use to buy in bulk a lot but it was taking up room in our house and tying up money in stuff we may not need or use for quite some time. I need to do a good de-clutter of our storage room! Bulk buying is such a handy tactic for saving money it does take a bit of practice or experience to know what to bulk buy though…for the sake of saving space that is! I have enjoyed trying to do a little simple living, but it can be difficult. Once I get it down, I do enjoy saving the money. I am a huge DIY buff and try to build or fix anything myself. If it is out of my wheelhouse, I will either learn or bite the bullet and pay someone. Like creating or breaking a habit, it takes time – but can be well worth it in the end. Don’t forget about Youtube for those diy projects, there is a wealth of information there. I have been doing a lot of DIY around the house but it definitely isn’t simple! It is a good learning experience though and does help save money most of the time. One of the big things about DIY is that that sense of accomplishment and it is something that can be done as a family event so to speak. I try to find a balance between living life while also living within my means (or living “simple”). I’m not huge on being a minimalist or cutting everything out of our lives, but we don’t have cable or internet on our phones. We also don’t eat out very often or buy things that we don’t need. Saying that, we do enjoy going on vacations and attending sporting events. As you mentioned, living frugally is different for every person; the important part is that you avoid debt and have money each month to save. This is a great tip that can easily be added to the points in the post…thanks for sharing! A most excellent list. My wife and I do a big garage sale each year which works great at getting some cash and at cleaning out the junk. SO MUCH JUNK! The idea of using sales is great too, my wife and I sometimes will wait on buying something we need for a long time until a sale comes up. SEems like these days, you almost never need to buy full-price. Think about trying to sell some items online (ebay), you may receive more there than from the garage sales. There is a bigger market online and they will bid against each other which means more $$$ for you. I’ve really started to get a kick out of doing DIY projects around the house. Not only is it usually cheaper, but I do like actually knowing how to do something (so I can fix it later) as well as the great feeling I get after a job well done. Its always great to find something that benefits the home but also yourself personally. Excellent post! These are the kind of post that a lot of people who are trying so hard to live an elegant life should read. Keep it real, keep it simple! Taking it back to basics 🙂 I’ve been kind of into DIY projects recently. Youtube has been an invaluable resource for me for small fix-it-up stuff around the house (apartment in my case). You’ve got a great list of simple ideas here that I think everyone can appreciate. I’m not very good at DIY projects, but I did start one the weekend – late spring cleaning of my kitchen! That’s great that you have started a new project with the kitchen. As mentioned in the post from Veronica, Youtube is a great source for step by step tutorials and videos in general on how to do things. Less stress = healthy life! Shopping online is almost always a winner! I also recently learned that through amazon you can have monthly purchases scheduled and delivered automatically. I’m thinking of checking this out. I love to get rid of clutter, it’s an obsession almost. If I can get money for it, even better. 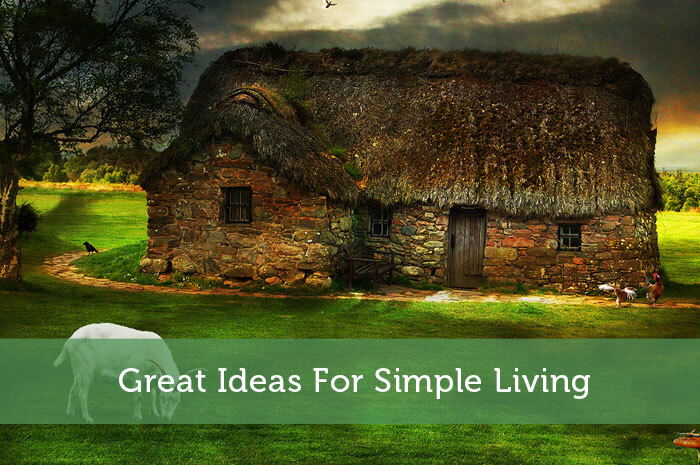 Great ideas for living simple indeed! There are some great books out there on this subject. I can’t find it now, but a couple of years ago, I read one that talked about exactly this kind of idea. Living a slower lifestyle while still maintaining contact with the world around us. If I can find it, I’ll reply to this comment. Meanwhile, another great resource, especially if anyone has toyed with the idea of homesteading as a blog called The Walden Effect. Living in Australia I can tell you that the single biggest way we save money is by buying things online (normally in the US or China) and shipping it over. For some reason the shops over here think they can screw their customers over and jack the price up by ridiculous amounts. At least it is slowly changing but yes, I think most Australians would agree with you! Its such a big misconception that simple living = boring. People really need to do a bit of self reflection. Totally agree that this can have a bit of strain on certain households finances, that’s why it is always good to start from a budget to make it work for a persons/families specific circumstances. This is an enlightening piece. It is worth living a simple life especially when the economy is a bit challenging. Yes, online shopping can help but you have to be careful with the vendors you choose. Certainly, creating a budget is the most important for homemakers. You have to be careful with your personal finances during trying times. People who buy in bulk eat and use in bulk as a result !!! I disagree with that generalization. Just because I have plenty of an item in the cupboard it doesn’t make me use more of it. What’s the difference if I’m just going to go and buy more of that item when I run out anyway? I can understand this statement although don’t 100% agree with it. If a person or family is bulk buying to save, it would defeat the purpose or offset the savings if they just blew through the purchases.